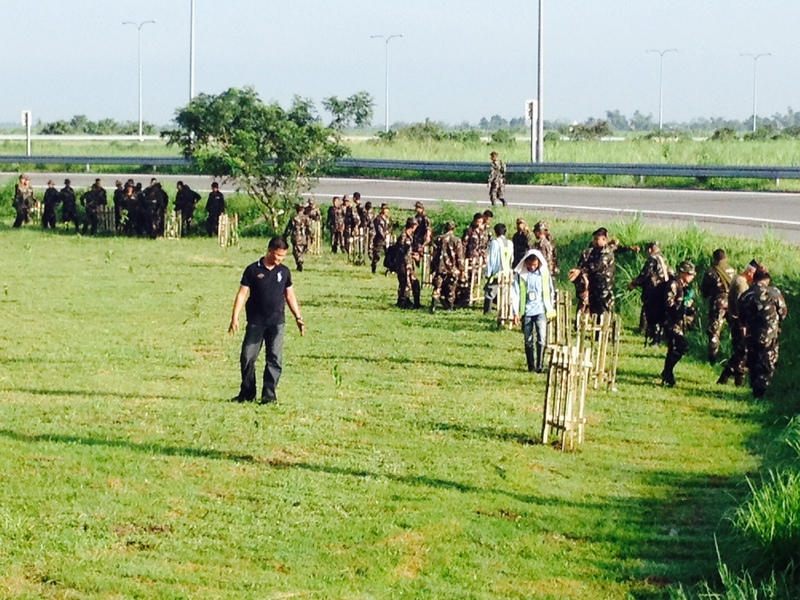 2014 Thousands of Indigenous Trees Planted Along Philippine National Highway | FEED, Inc.
23 September 2014, SCTEX, Tarlac. 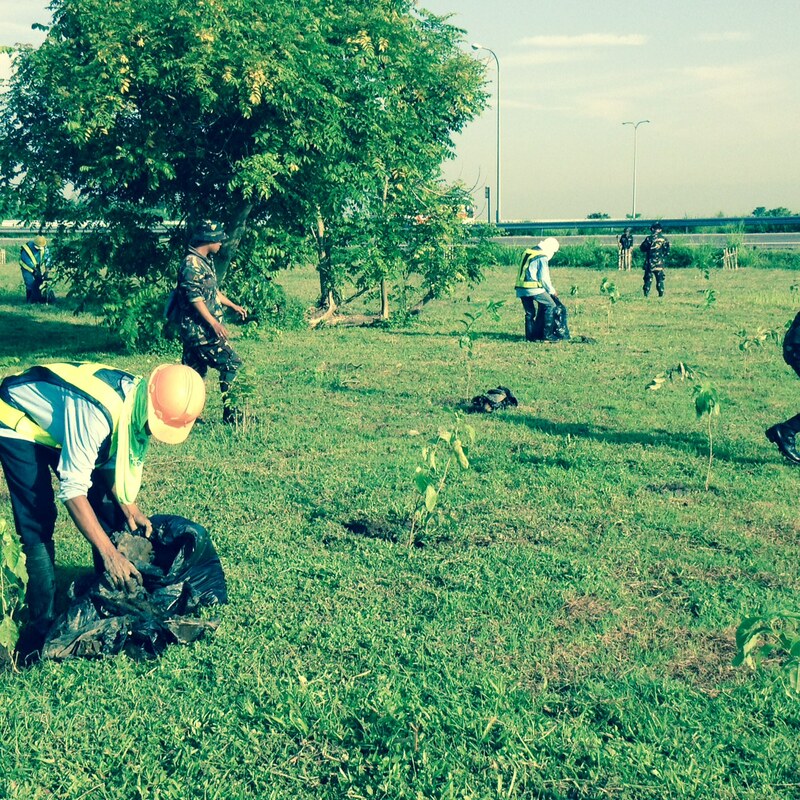 2000 indigenous Narra, Palawan Cherry’s and Banaba seedlings were planted along the 93.77-kilometre four-lane expressway north of Manila, Subic–Clark–Tarlac Expressway (SCTEX), on September 23rd as part of FEED’s ongoing “Living Legacy: Plant a Tree, FEED Our Future” program, and as a joint environmental project of Metro Pacific Tollways, Tollways Management Corporation, SCTEX, the Philippine Army (PA, 703rd Infantry Battalion, 7th Infantry Division/ID) and the University of the Philippines Los Baños (UPLB). Philippine forest cover now stands at around 7 million hectares, a far cry from the 21 million hectares of forest blanketing the country at the turn of the 20th Century. The government’s overall performance in reforestation averages 30,000 hectares annually, so it would take 280 years to reforest eight million hectares, according to the DENR-Forest Management Bureau. The National Greening Program (NGP) launched in 2011 converged the efforts of various agencies, including the Department of Environment & Natural Resources (DENR), the Department of Agriculture (DA), and the Department of Agrarian Reform (DAR), but the overwhelming targets will require support from the public, private and NGO sectors to achieve: 100,000 hectares and 100 million seedlings in 2011; 200,000 hectares with 200 million seedlings for 2012; and 300,000 hectares with 300 million seedlings annually from 2013 to 2016. Half of the total number of seedlings to be planted are forest tree species for timber production and protection purposes, with the other half consisting of tree species used in agroforestry sites conducive for growing cash crops and fruits. Aligned with NGP targets, FEED and partners aims to fill the gap of particularly native or indigenous tree species along national highways and protected forests, as well as fruit bearing and vegetable cash crops in rural areas to initiate sustainable economic, livelihood and reforestation development projects. FEED will continue to partner and focus its efforts on sourcing its own private sector financing, with the support of individual and corporate philanthropists and Social Community project co-financing; as well as the establishment of independent nurseries in the areas of its tree-planting. To date, aside from planting along national highways, FEED and its partner UPLB, are engaged in tree-planting and watershed management projects in the provinces of Quezon and La Union, respectively – in partnership with engaged leaders at the DENR, Regional, Provincial and Local Government Units, and the agro, forestry and farming community itself. FEED’s near decade long partnership with UPLB, and the recent Tri-Party MOU signed with the PA’s 2nd Infantry Division, enables each entity to provide for its own manpower to physically prepare the land for harvest and planting and within their respective NGP and other mandates. 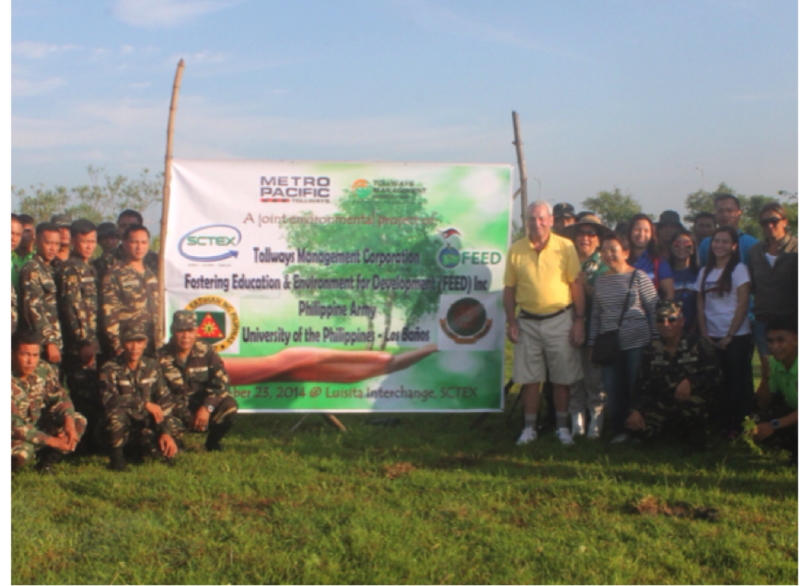 FEED’s President Ofelia Bakker-Mananquil has been planting trees along national and provincial roads in Tarlac Province, her hometown, since the 1960s, raised by a farming family and Philippine Army land overseer who always carried indigenous tree, fruit and vegetable seedlings to plant wherever he traveled. She is supported by her husband Jacob Bakker, primary sponsor of FEED, Inc. and agronomist by education. 200 PA officers were led by General Henry G. Sabarre, Commander of the 703rd Infantry Battalion, 7th Infantry Division (7ID) and Lieutenant Col. Nicholas Alarcio, Commander of the 702nd Army Brigade, and Col. Dave Diciano, Commander of 701st Infantry Brigade, MGen. Rodel Santos, Col. Oliver Maquiling, of the Northern Luzon Command in Manaoag, Col. Dave Diciano, Major Malate and Captain Balug – all staunch environmental advocates and practitioners. UPLB’s guidance on which trees to plant and how was guided by Dr. Arman Palijon, urban forestry expert, with the direct and full endorsement of UPLB’s Chancellor Rex Cruz. General Manager & Executive Director, Leadership Succession/First Pacific Leadership Academy, Mr. Roy Evalle – FEED friend and supporter, was instrumental to connecting FEED to the tollway companies for the initial talks. In light of the real and present climate change threats worldwide, the urgent call to action from all walks of life is putting pressure on government leaders to renew commitments to cut greenhouse gas emissions or to give significant climate finance where it is most needed. In the absence, however, of any significant and coordinated government intervention, it is left to business, cities, campaign groups and individuals to produce the real action on climate change. With poor communities in the Philippines increasingly losing their homes and income due to climate change, this collaboration with the UPLB, the PA, SCTEX, Metro Pacific Tollways and the Tollways Management Corporation is a timely intervention attempt which the group agrees to continue pursuing. FEED, represented by Ofelia Bakker-Mananquil (President and initiator of the project) and Jacob Bakker (Chairman); and SCTEX, NLEX and Cavitex Corporate Social Responsibility Manager Maricar Pangilinan. Where could i possibly find free trees to plant. I have a land and would like to plant something in it but i dont have money to buy baby trees. I need about 500 trees.